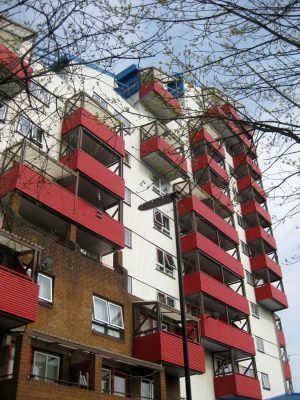 Byker Wall, along with the low rise dwellings built to its south, replaced Victorian slum terraced housing. There were nearly 1200 houses on the site at Byker. They had been condemned as unfit for human habitation in 1953, with demolition starting much later in 1966. 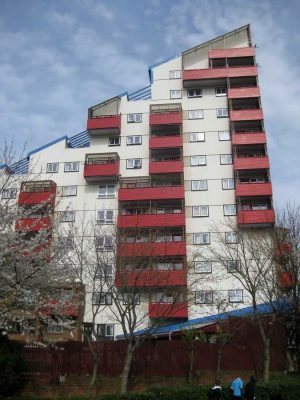 The new housing block was designed by the notable architect Ralph Erskine assisted by executive architect Vernon Gracie. Design began in 1968 and construction took place between 1969 and 1982. The architects opened an office on site to develop communication and trust between the existing residents. Existing buildings were to be demolished as the new accommodation was built.